Convenience is one of the key factors turning customers to online shopping. As a way to expand that same convenience and positive experience to delivery, we have teamed up with UPS® to make it simple for retailers to offer the option to ship to a UPS Access Point location to their customers. The UPS Access PointTM program allows these retailers to ship orders to nearby retail locations, so customers have a secure location to hold and pickup orders. UPS launched their UPS Access Point program in New York City and Chicago in 2014. At that time, the program proved to be a great option for those living in large cities filled with apartments and hard working individuals. It then expanded to additional cities in 2015. And, due to its success, there are now nearly 9,000 UPS Access Point locations in the United States alone. 45% of millennials prefer to have packages shipped somewhere other than their home. UPS Access Point locations take the convenience of In-Store pickup to the next level. It allows customers to avoid the rush in the store while giving them the option to pick up their order at a closer location with extended evening and weekend hours. 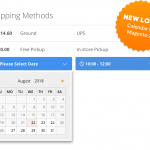 Offering extended pickup hours is a huge plus for those who work and have busy schedules, it allows them to pick up their packages on their own time without hassle. And, to add to the fun, customers are normally faced with lower shipping costs when choosing the option. Shipping costs are a determining factor for many online shoppers. If faced with high shipping costs, many will abandon cart and move on to a competitor. By shipping to a commercial location within the UPS Access PointTM network, you will be presented with lower costs which opens the option of enhancing customer experience and beating out the competition with lower rates at checkout. The ship to UPS Access Point option is also becoming increasingly popular due to the security it offers. We’ve all seen videos showing individuals snatching packages from doorsteps, leaving customers frustrated not only at the thief, but the retailer as well. The retailer is then faced with a tough decision: Do you replace and resend the item for free? Or risk your customer leaving a bad review due to an extremely negative delivery experience although you have done your part in getting the item to its destination? With UPS Access PointTM delivery, both the retailer and their customer can be rest assured that the delivery will be safely held until the customer is ready to pick it up. Which means you aren’t left with the cost of sending the item again and will have greater visibility on who is picking up the delivery. In turn, you should see an increase in customer satisfaction. Both ShipperHQ and UPS work to help our merchants stay ahead of the curve by giving them the tools they need to easily move their businesses forward. Both companies understand that an excellent shopping experience has to include great shipping options, so we have come together to offer retailers a Free ShipperHQ Plan for Ship to UPS Access Point. 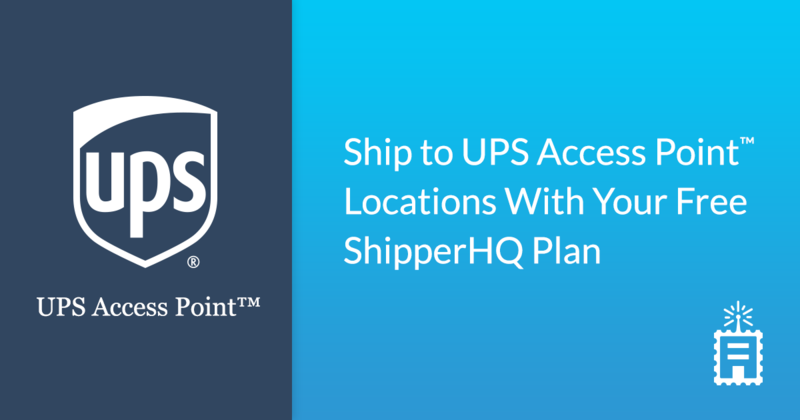 You can easily sign up for your Free Ship to UPS Access Point Plan and activate UPS Access Point option in your checkout by signing up for a UPS account and setting up Ship to a UPS Access Point location information as a carrier in ShipperHQ. If you already have a ShipperHQ account, or would like to upgrade your ShipperHQ account so you have access to all the bells and whistles, you’re in luck! Every ShipperHQ plan offers UPS Access Point delivery as a small package option. You will have the option to customize your UPS carriers with restrictions, discounts, surcharges and much more. Contact us to learn more about how you can upgrade to a Standard, Pro or Enterprise ShipperHQ plan for free through the UPS Customer Technology Program (CTP).